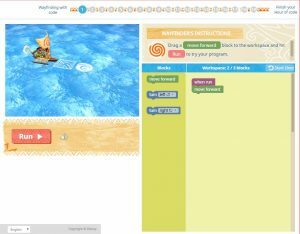 Code.org and Disney have released a new Hour of Code tutorial featuring characters from the upcoming Disney animated film Moana and it is simply brilliant! This is a great edition to their already vast and wonderful resources and a great way to get children coding during the Hour of Code between December 5-11. The graphics are amazing and children will be really engaged with this coding activity. No coding experience is required and there is loads of help, so as a teacher, you can feel confident in sharing this resource with your pupils.